This machine is studied to straighten and cut - with orbital system - copper, aluminium, light alloys and steel tubes, starting from coils. 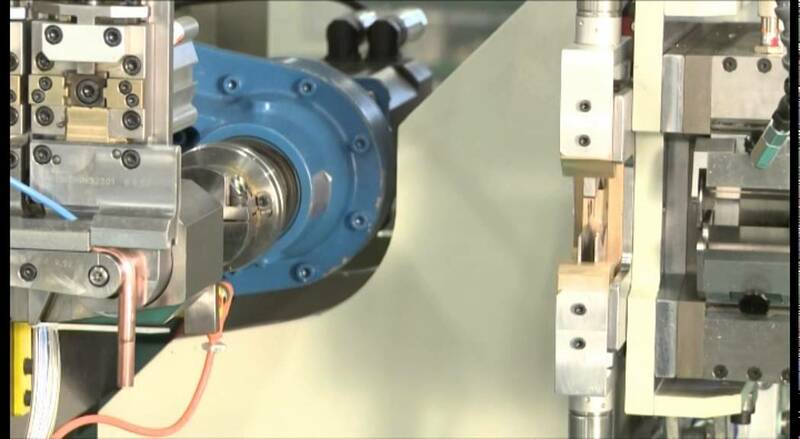 The particular pneumatic pull-apart cutting system, thanks to its high power, guarantees burr-free and chipless cuts. The major advantages are the rapid adjustment to different tube diameters and an exclusive system for bringing the cutting knife to the required depth in a very short time. The MTS machine is “Modular” because it is studied to be easily coupled with a vast range of optional operative units as for example a PNP 16 unit that bends tubes and a PNC 16 that crimp/end-shapes the tube. SMI s.r.l. Sistemi Meccanici Industriali manufactures since 40 years, a vast range of automatic, PLC and CNC controlled machinery and equipment for working tubes & pipes made from copper, aluminium, CuNi, Mild Steel and Stainless steel, in various diameters and thicknesses. Amongst these, you could find: ORBITAL CUTTERS, CNC BENDERS, DRILLING MACHINES, HORIZONTAL EXPANDERS, COIL BENDERS, TUBE INSERTERS, END-FORMERS, AUTOMATIC WORK CELLS and much more. Our machinery and equipment is mostly used in the Air-conditioning, Refrigeration and Heating industries, automobile industry and solar energy as well. SMI’s in-house production, guaranteed by the symbol 100% Made in SMI along with its outstanding vocation to customize standard machines and integrate automated systems, all made to customer’s specific request and to his full satisfaction, added to a considerable designing and manufacturing capability of components, accessories and special and personalized equipment, makes each machine unique.